My long-laid plan to read all of Emile Zola’s 20-volume series of novels, the Rougon-Macquart, is still far from complete. I have managed to read about half of them in the original French, and then a couple of the more famous ones (Germinal, La Bete Humaine) in English translations. It is, believe me, quite a haul to read in their original language 20 novels each of which, in the Livre de Poche paperback editions that sit on my shelves, runs to about 500 pages. That totals, in case your Maths is almost as feeble as mine, about 10,000 pages. I will get there one day. Promise. But I’m afraid other reading will distract me until I am able to take a very, very long holiday. I find his determinist conception of human nature and his reductionist representation of human institutions almost totally repugnant. Partly it comes from my being a Balzacian, interested in that dogged French attempt, begun by Honore de Balzac in La Comedie Humaine, to summarise the whole range of a given society in one big roman fleuve. 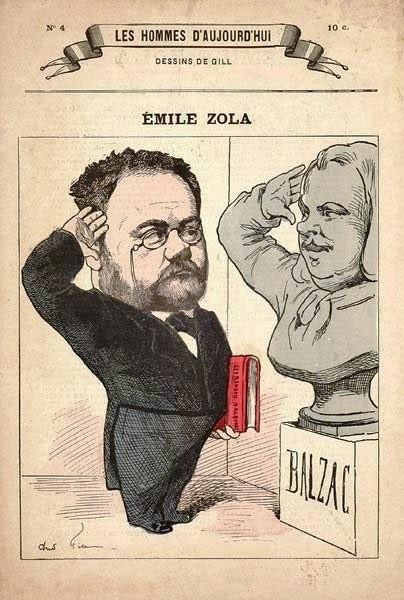 Even in his lifetime, Zola was seen by French critics as somebody who was trying to outdo Balzac [see accompanying cartoon]. Partly my interest comes from the sheer melodrama into which Zola nearly always descends – the man who documented scrupulously the external and material details of life was definitely not capable of subtle psychology, and there usually comes a point in his novels where, to round things off and bring his tale to a neat conclusion, he suddenly jerks his characters into the most improbable of events so that he can reach an explosive finale. And partly my interest comes from the way Zola reflects a certain period in history. Maybe this last attraction is, to the historian in me, the strongest. Zola’s very imperfect novels are ersatz historical documents. 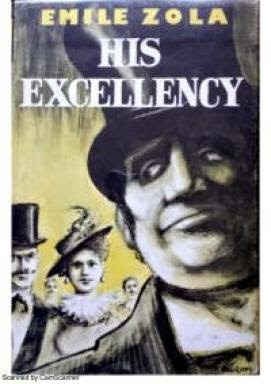 This is certainly the case with one of the most obscure and least-read of the series, Son Excellence Eugene Rougon. Zola, writing in the 1870s after the Third Republic had been established, dissected in his whole roman fleuve the Second Empire of Napoleon III. In this particular novel, he focuses on the upper reaches of the regime’s political system. Son Excellence Eugene Rougon is the story of a high official in Napoleon III’s government and his many flaws. The story specifically unfolds between 1856 and 1861. The clearest aim of the novel is to expose the undemocratic nature of the Second Empire and the sham of “democracy” when the regime claimed to be “liberalising” in the 1860s. Zola is attacking the special interest groups that had the ear of the non-democratic government (especially provincial bourgeois entrepreneurs – all of whom seek to be honoured with imperial titles). As usual, he is likewise attacking the church, which sought to bring Napoleon III’s regime into the defence of the Papal States in Italy. At the same time, Zola wishes to expose patterns of patronage when there is no real popular voice. Very incidentally, he also enjoys depicting the sheer tackiness of imperial ceremonial, as if Napoleon III’s court and its hangers-on are at best play-acting at being the masters of the nation and do not have the real sense of style of the first Napoleon or even of the old royal courts. 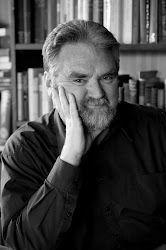 His protagonist, Eugene Rougon, comes from a humble background and has made his way into high office by sheer cheek and graft. He hails from Plassans, the fictional town which Zola based on his hometown of Aix-en-Provence and often used to represent provincial France. Eugene is regularly besieged by people from Plassans who ask him for special favours. Near the beginning of the novel’s fourteen long chapters, Eugene has just lost his position as president of the Conseil d‘Etat, Napoleon III’s inner circle of ministers. Much of the action that follows concerns his attempts to regain a position as a member of the emperor’s cabinet and to outmanoeuvre a powerful political rival, the Comte de Marsy. Eugene falls in with the intrigues of an influential Italian woman, Clorinde Balbi, whom he hopes to make his mistress. She marries another politician, Delestang, and Eugene Rougon himself makes an advantageous marriage with one Veronique Beulin d’Orchere, whom he treats mainly as a domestic convenience to help him host his political soirees. Eugene continues to think of power without actually finding a way to exercise it. He dabbles in political science by planning to write a study comparing the English and French constitutions, but he never gets on with it. He thinks of abandoning national politics for schemes of public works in the provinces. He is a dilettante and a schemer rather than a real thinker. He still hopes that Clorinde Balbi, who has been the mistress of many influential men, will help him attain greater power. Eugene believes the machination of Clorinde Balbi will help him to regain his position. The arc of the novel has him gradually coming to understand that her main purpose is not to help him, but to advance her rather gormless husband. Clorinde ends up with so much influence because she becomes the mistress of the emperor himself. Her husband ends up as Minister of the Interior. So, by the novel’s second-to-last chapter, we seem set up for Eugene’s final defeat. Having lost power and influence, no longer courted by his former clients, he disconsolately wanders the muddy streets of Paris, seeing people more powerful and influential than he riding past in carriages. But there is an ironic conclusion, for three years later there is a scene in the Legislative Assembly where de Marsy now presides and Delestang is an important minister. The empire has been partially “liberalised”, so that opposition members are able to make speeches and there are an increased number of ministers without portfolio, of whom Rougon is one. An opposition member makes a speech protesting against the restrictions on freedom and especially freedom of expression. In reply, Rougon rises and, as de Marsy and Clorinde and others look on, gives a long speech on the glories of the empire as the inspiration and envy of all Europe and as a system that grants enough freedom to allow the country to prosper without falling into licence. This draws a standing ovation and the clamour that Eugene Rougon is still a great man. The novel ends with Clorinde saying to him “Vous etes tout de meme d’une jolie force, vous!” (“After all, you are still a force to be reckoned with!”). The implication is that what Eugene cannot achieve by intrigue, he might achieve by hypocritical oratory. And indeed we know that his oratory is hypocritical, for by this stage he is fully aware of how corrupt Napoleon III’s ramshackle state his. His hope now is simply to use that corruption to his own advantage. There is one thing to be said in favour of this lesser instalment of the Rougon-Macquart series. It is one of Zola’s novels which (untypically) does not descend into melodrama. The final irony might be crude, but it is in character and consistent with what has gone before. There is here the usual Zolaesque love of set pieces. I think of the opening scene in parliament (Chapter 1), where he shows that the chief business of the day is simply rubber-stamping money orders requested by the emperor. The practical impotence of the parliament is thus dramatized. In Chapter 4 there is the set piece of the vast procession for the baptism of the Prince Imperial, which gives Zola the opportunity to use all the details he mugged up from the Moniteur describing the event. In the crowd, some people still shout “Vive la Republique!” showing how shaky Napoleon III”s hold on power still is. In Chapter 7, a detailed account of an imperial reception at the palace at Compiegne includes Rougon seeing the silhouette of the emperor conferring with one of his secret policemen, and thinking “Sa bande l’a fait, lui.” (“His gang have made him what he is.”). An attempted assassination of the emperor (based on a real one) is recounted in Chapter 8 and there are details of the ensuing repression in Chapter 9. In Chapter 10 there is Rougon presiding at the beginning of work on a new railway tunnel in a provincial town. Zola is able to satirise the interests of competing capitalists who are attempting to get contracts for this public work. As well as these set pieces, there is also the intertwining of sexual opportunism with public corruption, a common trope chez Zola. When (in Chapter 11) Clorinde playfully suggests to Rougon that she has slept with a lot of influential men in order to advance Rougon’s career, he brutally asks her “Why not with me then?” and attempts, without success, to jump on her. By Chapter 13, Clorinde is presiding over a salon in alluring garb, selling drinks and selling a kiss to a millionaire for a huge sum. Around her neck she wears an expensive collar proclaiming herself somebody’s pet dog. It is now well known that she is Napoleon III’s mistress – people talk of the way she has methodically slept her way to power. And yet nobles and their wives court her and flatter her. It has to be said that (even more than with Zola’s other novels), one would have to know the specific details of French history to really get the force of this political novel. It contains things that would doubtless have been still topical when it was first published and would therefore have resonated, for its first French readers, with nuances that are now hard for us to detect. The action very specifically takes place over five or six years and refers to well-known public events – the baptism of the Prince Imperial in 1856; the attempted assassination of Napoleon III by Orsini in 1858; the ensuing repression; the assistance given by France to Piedmont in Italian unification; and then the concessions made to the clerical party when it seemed likely that the pope would be threatened; and the “liberalisation” of the empire in the early 1860s. Further to the specific historical events, there is the fact that some leading characters are obviously based on real people. Eugene Rougon himself is apparently – in the public things that are ascribed to him – a combination of a number of real politicians and ministers. Clorinde Balbi is very specifically based on the emperor’s Italian mistress the Countess of Castiglione. De Marsy is based on the Duc de Morny and so on. It would appear to be Zola’s intention to show the petty politicking between self-interested rivals at court and in the ministries, and the sham nature of the empire’s “liberalisation”. Zola may think he is showing us something shocking in the way personal antagonisms and power-plays are acted out in the imperial government; but a study of history suggests that Napoleon III’s government, tacky and ostentatious though aspects of it were, was no worse in this respect than other nineteenth century European governments. But what does the novel mean to us, apart from being a series of historical footnotes? Eugene Rougon himself is almost as uninteresting a character as Balzac’s Cesar Birotteau – essentially an unimaginative country politician who thinks mainly in terms of serving his clients, particularly in his provincial power base. The thinness of Rougon as a character is revealed, for example, in how we scarcely learn anything about his wife or his reaction to her after she is introduced and then ignored as a character. Does Eugene Rougon think no more of her? This may, of course, be the novel’s point – Eugene Rougon is a mediocrity with power. Son Excellence Eugene Rougon may be a time-specific work, but mediocrities with power we will always have with us.